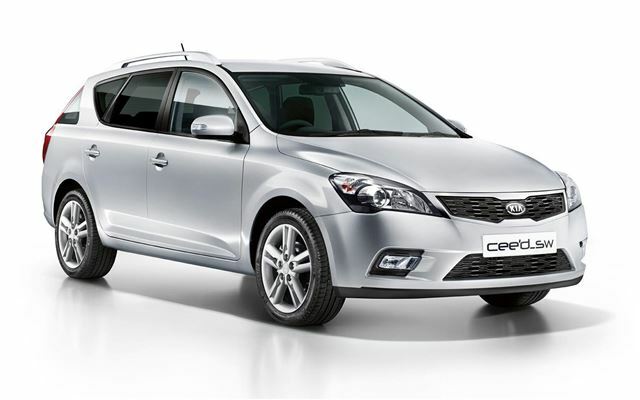 Kia has added a new top trim level to the cee’d and cee’d SW ranges. The ‘4’ trim level includes integrated sat nav, leather upholstery, cruise control and a reversing camera, as well as a more powerful version of the 1.6 CRDi diesel engine fitted to other models in the cee’d range. Prices start at £19,195 for the hatchback and £20,345 for the SW. The hatchback cee’d 4 manages 62.8mpg and 119g/km of CO2, while the SW estate is down on those figures slightly with 60.1mpg and 124g/km. There’s an automatic version of the SW which costs an extra £1,000 and returns 48.7mpg and 154g/km. Externally the ‘4’ models are feature 17 inch alloy wheels black headlight bezels, tinted rear glass and indicators integrated into the door mirrors. The cabin benefits from a seven-inch touch screen infotainment system, which includes the read out for the colour reversing camera and sat nav system as well as iPod and AUX connectivity. SW models get an audible reverse parking sensor to help with the longer dimensions, too. As with all Kia models it comes with a seven year 100,000 mile warranty.